Choi Jung-wha, president of the Corea Image Communication Institute, firmly believes that to thrive in a global community, people should learn to respect and care for others as cultured citizens. She also regrets that many Koreans do not know much about their own culture, history and heritage, while being more passionate about foreign cultures. 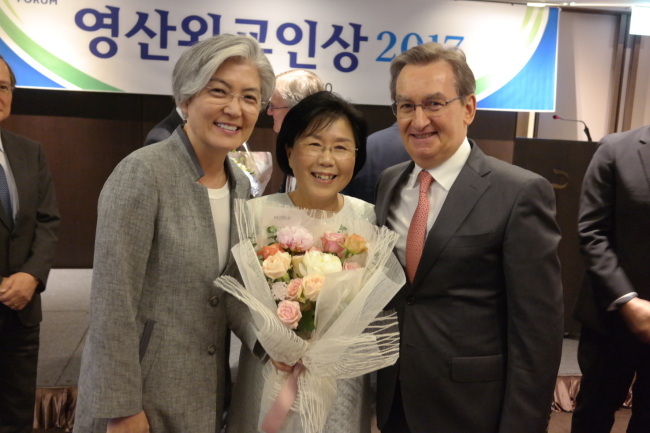 Choi’s decadeslong efforts to bridge Korea and the world bestowed her the Yeongsan Diplomat Award on Wednesday, given to individuals who made superb achievements to enhance the nation’s image and interests around the world. “Being a cutthroat competitive society built on the ashes of the Korean War, we have kept rather high opinions of ourselves close to our hearts, while often discrediting other people’s opinions, desires and needs. In our interconnected world, we should learn to respect differences and listen to one another to prosper together,” she told The Korea Herald at the award ceremony in Seoul. The event at the Plaza Hotel Seoul gathered leading opinions from across the nation, including South Korean Foreign Minister Kang Kyung-wha, who gave congratulatory remarks, as well as British, French, Japanese and Singaporean ambassadors, politicians, businesspeople and journalists. Former South Korean ambassador to the US, Ahn Ho-young, was a co-recipient of the award, conferred by the Seoul Forum for International Affairs. Stressing that public diplomacy requires both the substance of attraction and means of promotion, Choi said she tried to enable both through CICI activities and the publication of books. “K-Style,” written in English and French, introduces Korean culture and lifestyle to foreigners, with aims to make them fans of the country as well as globalize Koreans' perspectives. In 2003, the year she received France’s highest award, Legion d’Honneur, Choi founded CICI, a nonprofit public diplomacy organization registered under the Ministry of Foreign Affairs. The CICI organizes year-round networking events and awards, such as the Culture Communication Forum, CICI Korea Image Awards and Korea CQ Forum. Hundreds of opinion leaders -- ambassadors and diplomats, corporate executives and entrepreneurs, scientists and engineers, artists and journalists -- have been CICI members or graduated from its programs.